The Absolutely True Diary of a Part Time Indian is one of those books I’ve seen a thousand times in book stores but never picked up. I recently heard about the book getting banned in some schools in Idaho, so my interest was piqued just in time for it to be the final novel of my semester this spring. The first day of our reading was about 66 pages, only the first few chapters, but after I started I couldn’t stop. I was so drawn into Junior’s life that before I knew it, it was 1 AM and I was halfway thru. Junior is an outcast. In his own words, he is the black eye king of his reservation. Born with “water on the brain” he had surgery at three months old that he wasn’t likely to survive. Said surgery left him seizure prone and and stuttering, awkwardly tall and big footed. He is a constant target for bullies (some as old as thirty!) and gets by with a little help from his friend Rowdy and escapes by drawing cartoons of his life. When a teacher tells him on his first day of high school that he needs to save himself by transferring to the white high school, Reardon, he takes the advice to heart and transfers the very next day. Determined to make something of himself, Junior sometimes walks 22 miles to school, takes on new bullies, joins a basketball team, and encounters tragedy that would stop some people in their tracks. 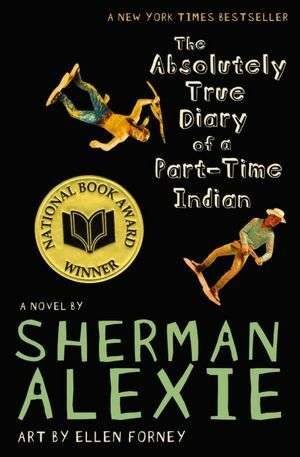 Filled with heartbreak and despair but set off with sarcasm and humor, Sherman Alexie’s semi-autobigraphical YA novel paints a very real portrayal of Native American life on and off of a reservation, and the consequences that come from leaving the only life one has ever known. I absolutely loved this book, both as a work of YA fiction and an examination of the stereotypical thoughts and actions towards Indians and reservations. It really makes you think about the way we look at the world and the privileges we have everyday without even noticing. Definitely recommend, whether you typically read YA or not, this one grabs you from the first page. Have you read The Absolutely True Diary? Have you ever had to be like Junior and strike out on your own to reach your dreams? I read an excerpt of this in my American Lit class this year, but we never finished the entire book. I’ll have to go back and the read the whole thing after reading your review of it! You definitely should, it’s so good that you fly through it! I read a different Sherman Alexie book (there was a sale, dangit) and I really liked it. I think I might save this one to read and review during Banned Books Week, but it shall be read! 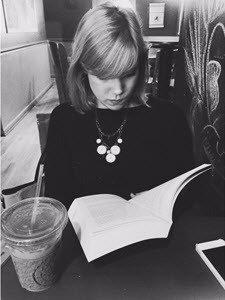 Loved the book – couldn’t put it down! Even with so much humor, it was able to hit upon ideas that are so tragically compelling. That’s exactly why I loved it so much!